I see a rock on the nook of this tree every time I go to the park. Whenever I see it I look around, scouring the park for who might have placed it there as if there is some phantom rock leaver wandering the city streets. It gets me thinking about rocks and stones. Cairns. They were small mounds of stones used to mark graves. A few cultures adopted the practice – from the ancient Celts to the Tibetans. I read that the stones weren’t just used to mark graves, sometimes they signified the summit of a mountain or a special event. It’s a nice thing to contemplate – a rock or stone, smooth and sun-washed representing endurance and strength. Rocks and stones are part of Jewish custom too. They are left on headstones or graves as a sign of respect, to mark a visit, to suggest the continuing presence of love and memory which are as strong and lasting as a rock. I like that custom a lot. I often pick up rocks as I walk along. I have jars full of them…not all of them are perfectly formed or full of flecks of colour….but somehow the ones I rescue from the streets say something to me, something like a story or a song or the way a moment appears in a photograph. I think rocks hold onto things like feelings and hopes. I have a few lucky rocks that I clasp in a heartfelt way when I’m feeling stressed or overwhelmed and they don’t necessarily change my luck but as they warm in my hand they have a calming effect and make me feel I can move forward. The other day I discovered who was leaving the rock in the tree. A girl, pretty in an earnest, fresh-faced way, seemingly relaxed and nonchalant, but with eyes that are intense and searching. She lost her love. It sounds melodramatic to say it, but that’s what happened. He died in a fishing accident in one of those horrible events you hear on the news where fishermen are washed off rocks by a raging sea. They never found his body. Rocks can give to us but can also take from us, joining with the elements to show us that they are the ones in charge of it all, not us. The tree in the park was the last place the girl saw her love. They had shared lunch on the grass, leaning against the trunk. They laughed, feeding the ducks, watching babies with chubby legs chase butterflies. She never saw her love again. I can’t imagine the gravity of that – it would be like dangling over a chasm for eternity, never able to free yourself or have the relief of falling. Without the body being found the girl has created a mythology in her mind that maybe he is not dead, maybe he will come back. She was uncomfortable saying it, but I could see she wasn’t ready to stop thinking it. She places the rock on the tree as a touchstone, a beacon calling him out of the sea and back to land to the place of sandwiches, ducks and laughing babies; to the place where she is, waiting. I touch the rock when she is gone. It is white with grey chips. It is rough as if it was flung up from the road by a passing car. I expect it to be warm, to fill me with a spark as if it full of magic, as if it is part of an alchemist’s arsenal….but it is cold, it’s been waiting in the tree for too long. I feel bad. I want the rock to be hopeful, not mournful…. I want it to be more than a little conduit of sorrow. As the sun sets, the light is cast through the trees. The grey flecks in the rock catch the light, sending out small rays like fingers. The rock comes alive seeming to say: People were happy here once, they laughed and were in love. The light deepens. I move off, back home, looking back. The rock is nestled, coated in the falling night. It seems like something that belongs there. Maybe it is not as mournful as I originally thought. Maybe it is about endurance and being strong in spite of everything. Maybe it is about remembering. I go home. The shadow branches from the park follow me out to the street. I find three stones, soft brown hues like baby bird feathers. They are warm in my pocket. It belongs there. It creeps, like a turtle. Oops! I wrote that before reading the whole thing. Sorry. Still, it probably sometimes does, the way a cat always goes back to the same spot to sleep. My entire front yard is raised up on a stone wall held together by concrete and I hate the way the concrete top surface looks. I have spent years dragging gorgeous rounded perfect beach rocks from the beach an hour away (hopefully not contributing to beach erosion, my yard is very small) so that now the entire top is lined with beach rocks. Last week I saw one of them in front of my neighbor’s house. “She stole my rock.” Crazy thought. There are millions on certain beaches. Still, I was certain she did. You can’t go to the beach and bring back only one. At least I can’t. I often have sudden gaps, which is OK. I just shuffle them and the gap disappears. It was a piece of my yard and my love of the beach, just one tiny piece. And I thought it was sweet that the rock had travelled by some means other than the waves or my car. I pass it now and feel happy to see it among all her garden stuff. Yes, and the rocks on Jewish graves. I am Jewish and do that with all graves. It seems so much more appropriate than the sacrificing mortal flowers. I love my flowers leaning against my rocks. They are opposites in some ways. I like the idea of rocks on graves too, Squirrel. There is a solidity about them that is comforting. It just seems right, somehow. One of my neighbour’s DID steal some of my other neighbour’s rocks that she found down the south coast. It was obvious. And very brazen…she didn’t try to hide it. My other (nicer) neighbour was really upset about it so in the middle of the night I stole them back. They haven’t been moved since. That’s me…keeping the rock status quo….hahaha. Sometimes, there’s stories spring up around them … like the one near the A591, on Dunmail Raise. It’s said to mark the resting place of Domnhall, the last King of Cumbria … athough I think it merely marks the border between the former counties of Cumberland and Westmorland. I didn’t realise a lot of people had been building the cairns just for the sake of it, Travelrat. That IS dangerous. What are they thinking?? The story is that Domnhall fell in battle here against the kingdom of Strathclyde. His supporters buried him under a large cairn, then fled, throwing his crown into Grisedale Tarn on the way. It is said that, if anything were ever to threaten Cumbria, the ghosts of the supporters would retrieve the crown, and take it to the cairn, whereupon the king would arise and deal with the matter. It hasn’t happened yet, though! In fact, the truth is that Domnhall really existed … but died in Rome, twelve years after the battle in which he is supposed to have fallen! Fantastic story. You know so much about history! Thanks for the lesson Selma. I now have a new respect for rocks placed in usual places. We have a rock pile in the backyard–lots of fossils–so connecting with the ancient past is always a short walk. Oh what a lovely post…the last lines brought warmth to my heart. I’m so glad, slpmartin. I didn’t want to write this as all gloomy/love lost/clinging to the past etc. I think it is a bit of a story of hope too. So glad you liked it! it’s good to remember, there are some things that have solidity, permanence almost, like rocks. i love rocks too, and collect them at the beach and put them around the flower beds. sometimes they have markings like pictures and they tell me something. i found one recently that seems to have the letters See U on it. See U. i thought of all the loved ones now departed, like my father, my favorite aunt, a friend who died recently. See U. It really moves me, i love this piece of writing, it really moves me, thanks selma! I found a rock a while ago that looks like it has runes carved into it, Tipota. I asked a friend of mine about it to see if it was a carving and he said it was just natural weathering. It seriously looks like a carving. It is my special rock. I love when I find things like that. It’s like finding buried treasure!!! So sad for the woman – to not know (even though you do know deep inside) and to have no body is one of my worst nightmares – I see why she needs to put the rocks in the tree. This is a lovely story/prose piece you have written Selma and the ending is perfect – some warmth and hope to round things off. That’s the thing, Gabe, you would know, don’t you? It would be a terrible kind of knowing…… my heart went out to her. I think putting the rock in the tree helps her deal with the loss. I wanted some warmth at the end. The story was sad but I didn’t feel it was totally without hope. Thank you for your kind words!! What a sad but beautiful story of love and devotion. I don’t know how one would reconcile the never knowing about a loved one gone missing. I can’t imagine. In native belief, rocks have spirit as do trees, animals, and beings. The comfort and power of holding one in the hand or carrying it with you in the pocket is undeniable. Who of us has not created rock piles almost instinctively. Perhaps they mark the way far better than we fully understand. Beautiful post, Selma! I am amazed that you were able to discover the woman leaving rocks in the tree. I think you were meant to connect so she could share her story. I think there definitely are spirits in rocks. I can feel them in the rocks I collect. It is a comfort to me, for sure! I love rocks and also believe they have significance to places and times. They tell stories (I believe what Josie Two Shoes said, that the rocks have spirit) and we can hear them if we slow down enough to listen. I hope she has managed to tell her story to other people too, Karen. It will help her heal, I think. She as sad about it – there’s no denying it. I felt for her so much. I hope that in some way sharing the story helped. 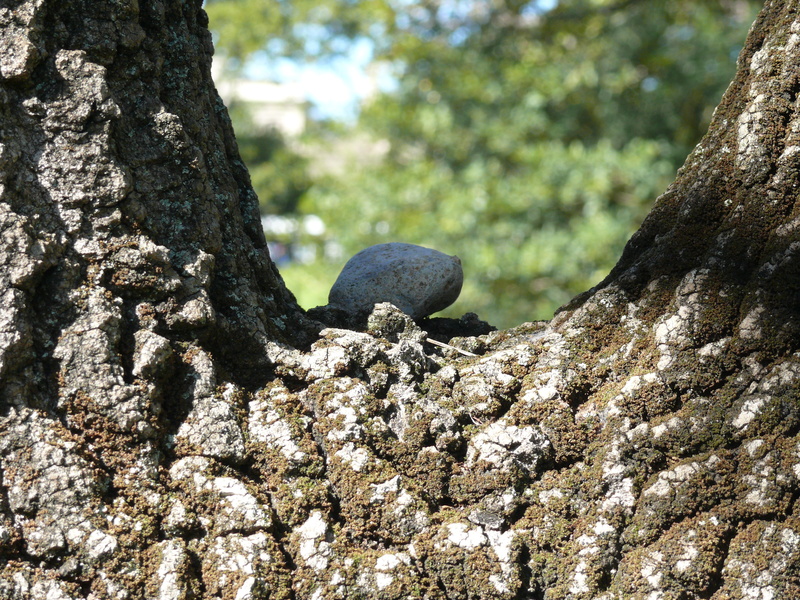 And there are definitely spirits in rocks…..
Well, I have a soft spot for certain stones and really liked what you shared here … it’s interesting what we will do, like put a rock in the branches of a tree, to help us get thru bad times. This was a really well told story, Selma. When I see these little gestures that people make to the memory of those that they have lost, I feel sad for humans – we seems so small at times like this. A beautifully written post, Selma. I didn’t know that about the excessive amount of cairns in the UK, Juliet. It’s obviously become a craze of sorts. Madness! You might have heard of the ‘Percy Unna Society’ … they devote their spare time to wrecking unnecessary cairns in the Scottish hills. I related to it too, Bandsmoke, even though I haven’t lost someone in that way. I guess I could relate to the sadness of it, the longing. Quite a moving story to encounter. When I was a child, I always looked for rocks that had unusual carvings on them in the hopes of finding a fossil. I encouraged the kids to do it too and have shown Lia rocks already and called them treasures that we carry in a pail. Funny how the tradition lives on. And I love the mystery of cairns and standing stones and the stories that are behind them. Awww that’s beautiful….collecting your treasures with Lia like that. How lovely. I’ve never found a fossil in a rock but would be so excited if I did. I love all the stories behind the cairns and standing stones too, Cathy. Just fascinating!